Anglo-Indian food is an absolute staple of UK takeaways, and while we may differ in many of our choices – korma or vindaloo, peshwari or garlic naan, bombay aloo or saag – we can all agree on one thing. Aren’t the poppadoms lovely? Beautiful crisp discs topped with onion, mint yoghurt, mango chutney and if you’re brave a bit of lime pickle. In another attempt to muddle up flavour profiles, I’ve attempted to bring that experience to the humble french fry. I’ve chosen french fries rather than chips because I wanted to evoke the crisper texture of the poppadom rather than the soft fluffy experience of a thick cut chip, but by all means mix and match. Just picture it. It’s a nice sunny day, you’re in the garden sipping on a chilled drink with drips down the glass. Then from inside the house, your loved one (or unloved cohabitor) emerges with this. A bowl of flavourful curry coated fries topped with the sweet-sour mix of mango chutney and mint yoghurt. You take a big bite and the tart pomegranate jewels explode between your teeth. Your taste buds erupt in rapturous applause. Cook your fries to the packet instructions, but ten minutes before they’re ready remove from the oven and toss with few teaspoons of curry powder. I think it’s best to give them the initial cook to allow the oils to begin to open up and the natural coating of the fry to develop. Also nobody likes a burnt spice. The mango chutney and raita should be of a consistency where they can easily be drizzled from a spoon. I put each in a bowl and added a teaspoon at a time of water and mixed until they were to my liking. Remove the fries and transfer one half to your serving bowl. Drizzle with a nice helping of each dip and then repeat with the remaining fries. Nobody likes getting through the top layer to find no dip underneath. Sprinkle over the pomegranates and you’re good to go! 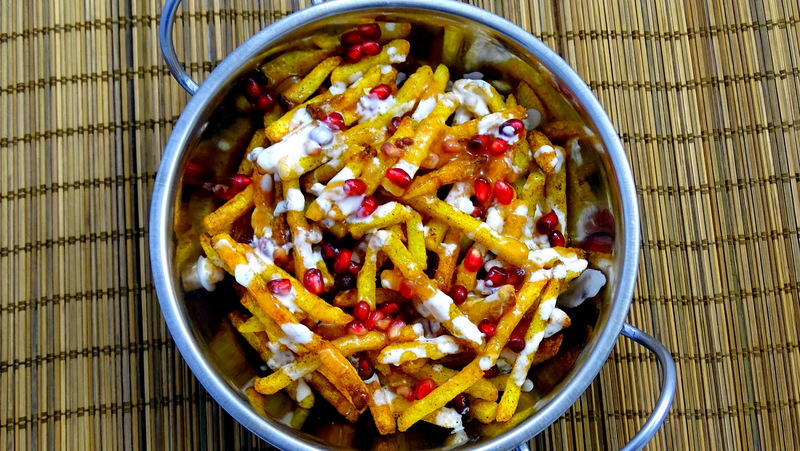 Posted in UncategorizedTagged chips, curry, english, food, fries, guesscipe, Header, indian, mango chutney, mint, pomeranate, raita, recipe, salt, summer, yoghurtBookmark the permalink.